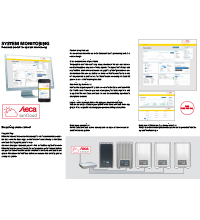 When the Ethernet interface of the coolcept inverter is connected to a router, the data from the data logger of the inverter (produced from 02/2018) is sent directly to the Steca sunCloud Portal. Setting up the portal is easy: On www.steca.powerdoo.com you will find an intuitive registration form. When the inverters are fixed, the serial numbers of the installed devices are queried. Several inverters can be combined in the Steca sunCloud to one plant. The data of the individual devices are added up and displayed as a complete system. 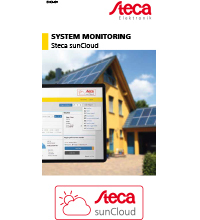 For our end customers the use of the Steca sunCloud is permanently available free of charge. The graphical user interface is very clearly structured. The user can look forward to thoughtful, very user-friendly aspects. The operation is simple and very intuitive, as the measured values are graphically intelligent and well understandable. The user can decide for himself which information he or she will be presented as and in what size. These include, for example, AC and DC services, as well as the income generated. Steca sunCloud Portal. With the intuitive user interface, you can access your yield data anywhere and at any time. The new Steca sunCloud can also be conveniently operated via smartphone or tablet. You can see the yield data of your plant in the Steca sunCloud. After logging in, it is also possible to change your personal settings at any time. Everuthing under control.